The Axis conventional zone monitor allows a zone of conventional detectors to be interfaced to an Axis intelligent loop. The zone can be powered from the analogue loop or from an external power supply - selection is made by two jumper switches. The current limitation of the zone circuit is programmable and adjustable by the control panel. The unit is able to identify all conditions on the conventional zone such as normal, open circuit, short circuit and alarm. In addition it monitors the power supply of the detection line - external or loop. 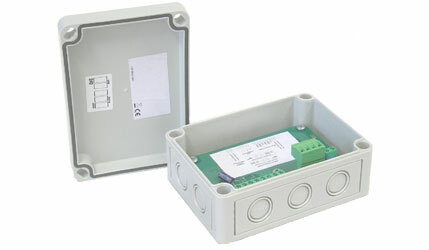 The unit provides fast and secure signalling, and incorporates a bidirectional short circuit isolator. A single changeover relay output is provided which can be switched on by a command from the control panel. This can be used for example, to provide a reset to certain conventional devices. The communication loop is fully isolated from the zone circuit and external power supply. The module is designed to be compatible with the majority of well known European conventional detectors.